Salads are the strongest category of food on the Panera Bread menu. The options are diverse and thoughtful. Go ahead and pick any of their leafy bowls, you can’t go wrong. While Fuji Apple may be the most well known and iconic salad available at Panera, the Asian Sesame option is an under rated delight. On the surface level, this is a simple dish. Romaine lettuce and chicken are the foundation of many Panera salads and the Asian Sesame is no different. However once you move beyond those constant elements, you’re greeted by an artful balance of flavors that push this item to new heights. Cilantro and asian sesame dressing compliment each other nicely providing an airy zip to your tastebuds. Crunchy wonton strips and toasted almonds top off the experience with not one, but two different crunchy sensations. The whole package is extremely satisfying. While this salad is one of the lighter options in its category, hungry diners should not hesitate choosing the Asian Sesame salad. Simply pair it with a hearty chili or a flatbread and your belly will thank you. Listen to our album “Fast Casual” HERE. With a plethora of options at your disposal, the Panera Bread menu is daunting. It can be helpful to ask yourself “what am I in the mood for?” If your answer is a sandwich, then you simply can’t go wrong with the Roasted Turkey Apple Cheddar sandwich. It’s the bread-bordered brother to Panera’s classic Fuji Apple Salad. Bread can make or break a sandwich, it needs to support the ingredients while assisting with texture and taste. The Cranberry Walnut loaf used here accomplishes all three tasks impressively. The soft bread absorbs the moisture from inside the sandwich while generally holding up structurally. An oversized slice of lovely white Vermont cheddar cheese acts as a canopy hanging over the rest of the ingredients. Plump slices of turkey (raised without antibiotics) are juicy and satisfying. The fresh apple and cabbage slaw provides a cool crunch to every bite. The RTAC is finished off nicely with the peppery twang of arugula and a mustard horseradish sauce. Panera makes a number of awesome sandwiches. This is one of them. It’s refreshing, reliable and is the only sandwich on the menu with cole slaw! Our 1st video from “Fast Casual.” "Dear Diary" chronicles Neil's journey turning a little dream into a big reality. 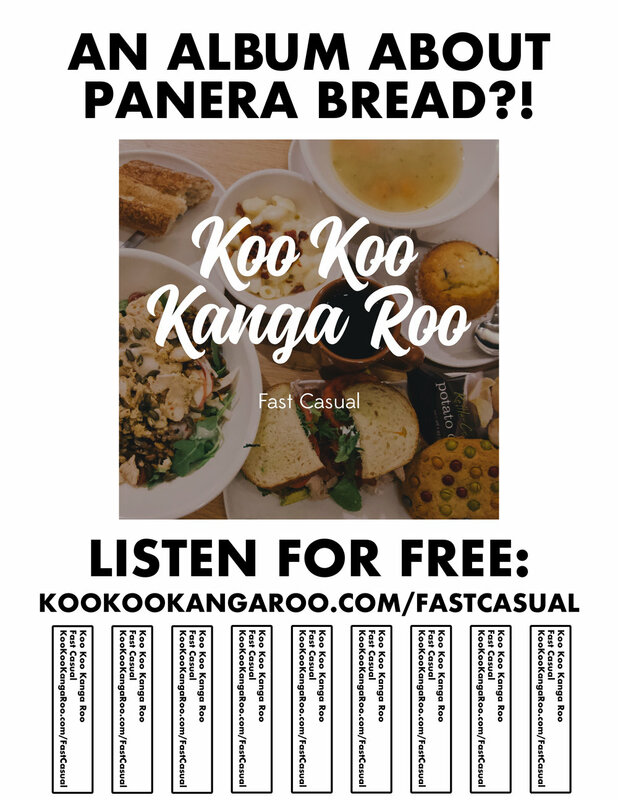 Hi we’re Koo Koo Kanga Roo and we love eating at Panera Bread! Panera Bread gets a bad “wrap.” Its the punchline in a joke about homogenized, suburban culture. But for us, its a more than a chain where moms eat after shopping at Old Navy. Here are three reason why we choose Panera Bread. While on tour, it is very easy to eat junk all day everyday. Pizza, burgers and chicken fingers are undeniably delicious but also pretty bad for your body. Sometimes we are faced with a choice between convenience and quality, healthy food, with Panera we get both. Also, Panera has a large, constantly evolving menu of food that allows everyone to get what they want. It’s nice to be able to eat a delicious meal that doesn’t leave you feeling bloated and guilty. While on the road, every day is different. Each day we drive to a new city, sleep in a different bed, and do our jobs in totally unique spaces. For the most part, this is fun and exciting. But sometimes we crave something familiar. In these moments we run into the welcoming, consistent arms of Panera Bread, where a nice healthy meal awaits us. Finally, caffeine is critical to our everyday lives and getting through long days of travel. While Panera’s coffee will never be mistaken for a single-origin Kenyan pour over, it is above-average and plentiful. When we have time to kill, Panera bread is our preferred destination for setting up shop with our laptops, a bakery item and some coffee.